used to have a sort of deep-found respect for Johnston & Murphy. They've been around forever (some 150 years) and they've always made a good product. As of late, they've even put out some more contemporary styles. While they do make some articles of clothing, they've always been known more for their shoes, particularly leather dress shoes. Their higher end dress shoes cost a few bucks more than typical shoes found in department stores, but they don't have any crazy shell cordovan available. I picked up a pair of "boat shoes" (aka topsiders) from them. Wore them for most of the summer, and then I noticed this (at left). Well that's just great - a crack in the sole that extends the width of the shoe. 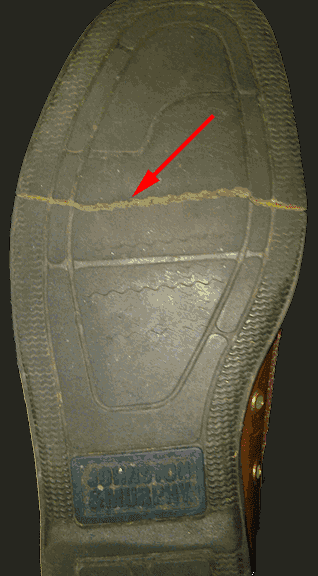 It's not shallow either, it cracked all the way through the sole! Thanks Johnston & Murphy, for quickly revealing to me that your customers pay for a brand name instead of quality. What this means for you? Buy your boat shoes elsewhere - consider Sperry for an example. Yes, they cost less than the J&M version shown here, but on the other hand, I've never seen one with a crack in it. I mentioned it before and I'll mention it again: It's not about the price - price does not denote quality. It's about the actual product, and in this case it's....not so good. Over a 99 dollar shoe that was made in china...bet u tried returning them AFTER you wore them ALL summer like u said, gross. Sweaty foot without socks and any shoe do not mix! So, that's what happens when you as the consumer demands lower pricing! If that shoe was made in the US it would cost you 4 times what u paid, but would have possibly lasted you eight times as long! I bet you even harassed some poor employee for a discount off of the 99 dollars... Didn't you! And seriously, how about contacting customer service! I buy custom selects by j&m they are made in good ole Nashville TN, not crap made in china!